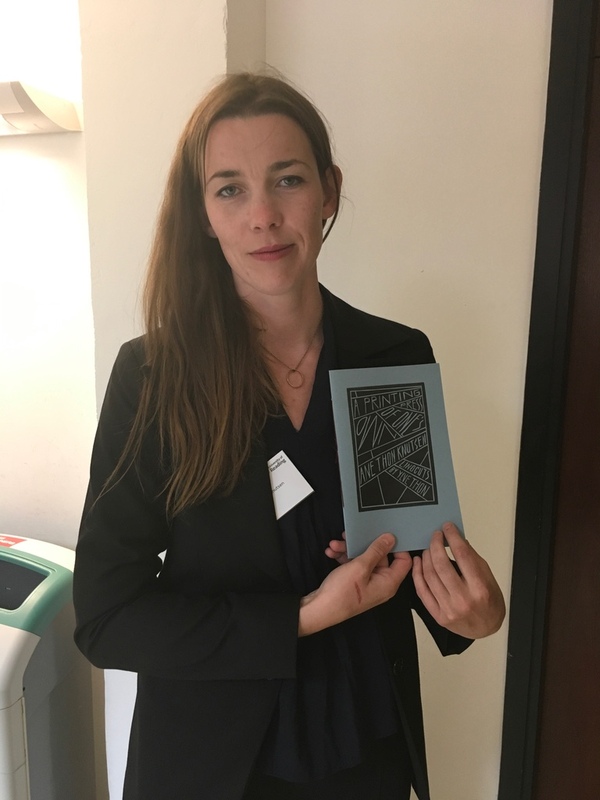 Ane Thon Knutsen with her hand-bound volume “A Printing Press of One’s Own,” introduced at this year’s Woolf conference in Reading, England. Ane Thon Knutsen combined two loves with her project A Printing Press of One’s Own — her love of Virginia Woolf and her love of typesetting. The two come together in her hand-set volume by the same name, which she debuted at the 27th Annual International Conference on Virginia Woolf at the University of Reading in June. It includes Ane’s personal, heartfelt essay about her experience finding a space of her own in which she could pursue her passion — typesetting. Her search occurred at a personally challenging time, soon after becoming a mother. 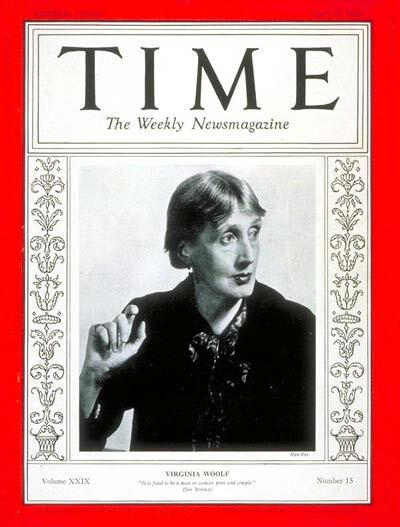 The intersection of the two — and the rescue role Woolf played in it — comprise her story. It includes her experiences conducting research at the British Library, which allowed her to handle the first volumes Virginia and Leonard printed on the Hogarth Press. What contrasts! In some cases they have really tried to print appealing books, but in others they have not made the effort, or investment of time. Inkblots. Everything off-kilter. The complete disregard for the sanctity of the type area. Scraps of paper crookedly pasted on to cover up misspelled names. Damaged types which had not been replaced. These are not books considered worthy of dignified display alongside William Morris and Gutenberg’s bible. This smacked more of punk rock and anarchy. The books bear the marks of temper and a strong will. I was touched. According to Ane, “The book is an essay referring to A Room of One’s Own by Virginia Woolf. 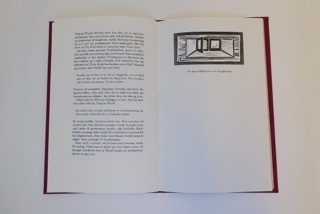 The essay reflects upon women’s role in letterpress, and the importance of a room of one’s own in artistic practices. 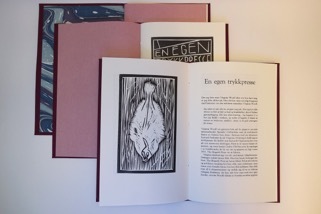 The illustrations throughout both the English and Norwegian versions of the volume are linocuts by Ane’s artist sister, Ylve Thon. 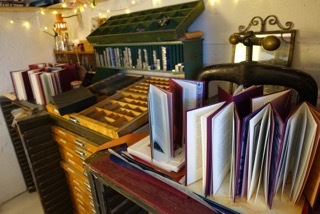 All text is hand set and printed together with linocuts on a proofing press. 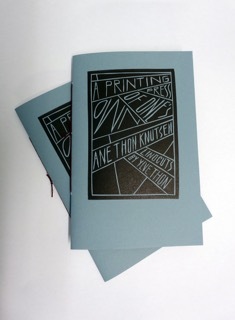 The English version has a blue cover, is digitally printed, and contains handprinted linocuts and is hand-bound. Both are for sale, with the English version priced at £18. The handset Norwegian version is £75. Ane’s volume is part of her artistic research project in graphic design at Oslo National Academy of the arts, where she works on a project investigating tactility in printed matter. You can follow her on Instagram @anetutdelaflut. 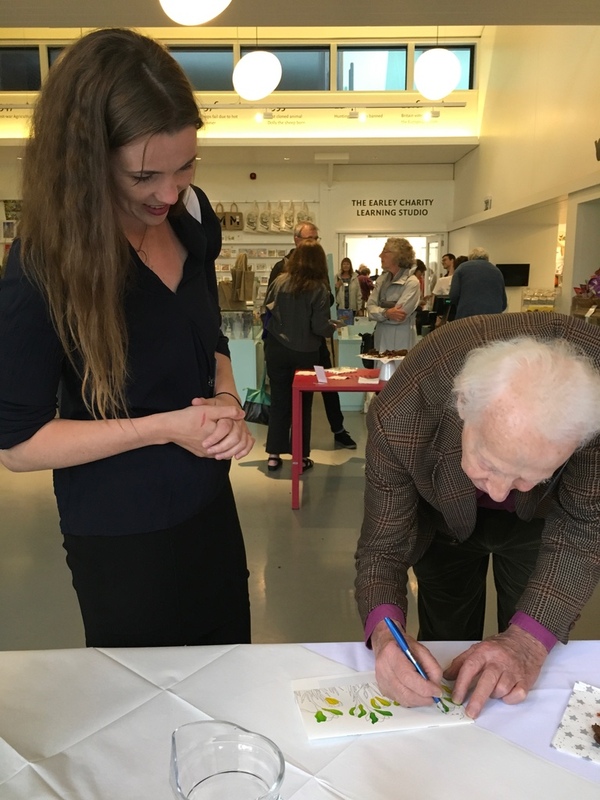 Ane met Cecil Woolf at the conference, and he graciously signed a limited edition Hogarth Press centenary keepsake of Woolf’s “The Patron and the Crocus,” available from Whiteknights Press.